Can science explain everything? Many people think so, and see no place for 'religion' in this time of rapid scientific progress. Oxford professor John Lennox offers a fresh perspective on the science/faith relationship, showing how they are compatible, and dispelling common misconceptions. 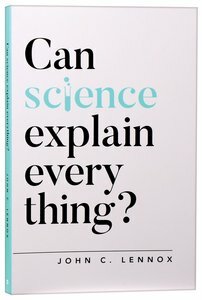 About "Can Science Explain Everything?" Can science explain everything? Many people think so. Science, and the technologies it has spawned, has delivered so much to the world: clean water; more food; better healthcare; longer life. And we live in a time of rapid scientific progress that holds enormous promise for many of the problems we face as humankind. So much so, in fact, that many see no need or use for religion and belief systems that offer us answers to the mysteries of our universe. Science has explained it, they assume. Science and religion just do not mix. Oxford Maths Professor and Christian believer Prof. John Lennox offers a fresh way of thinking about science and Christianity that dispels the common misconceptions about both. He reveals that not only are they not opposed, but they can and must mix to give us a fuller understanding of the universe and the meaning of our existence. John Carson Lennox was born in 1943 in Northern Ireland, the son of a shopkeeper, and grew up in Armagh. He studied at the Royal School Armagh, Northern Ireland and was Exhibitioner and Senior Scholar at Emmanuel College, Cambridge University from which he took his MA, MMath and PhD. While there, he heard lectures by C S Lewis on the poet John Donne. Lennox worked for many years in the Mathematics Institute at the University of Wales in Cardiff which awarded him a DSc for his research. He also holds an MA and DPhil from Oxford University and an MA in Bioethics from the University of Surrey. He was a Senior Alexander Von Humboldt Fellow at the Universities of Wurzburg and Freiburg in Germany. He has lectured extensively in North America, Eastern and Western Europe and Australasia on mathematics, the philosophy of science and the intellectual defence of Christianity. Between 2007 and 2011, Lennox was involved in numerous public debates in the UK, US, and Australia, wherein he articulated an intellectually robust Christian case for the existence of God. His interlocutors have included Richard Dawkins, the late Christopher Hitchens, and Peter Singer. Lennox has written a number of books on the interface between science, philosophy and theology. These include God's Undertaker: Has Science Buried God? (2009), God and Stephen Hawking, a response to The Grand Design (2011), Gunning for God, on the new atheism (2011), and Seven Days that Divide the World, on the early chapters of Genesis (2011). Furthermore, in addition to over seventy published mathematical papers, he is the co-author of two research level texts in algebra in the Oxford Mathematical Monographs series. Lennox is multilingual, fluent in Russian, French, and German. He is married to Sally, and has three children and five grandchildren.